Posted on July 14, 2012 by Sarah S.
As well as moving into my first place, I’ve also started my first job, and already I’m finding that cooking anything besides a frozen pizza is difficult. So I’ve decided to try out some easy, quick recipes and post the best ones here. I’m focusing on dishes that takes less than ten minutes to prepare and use food that I normally have around. The first dish is a really simple chicken parmesan. 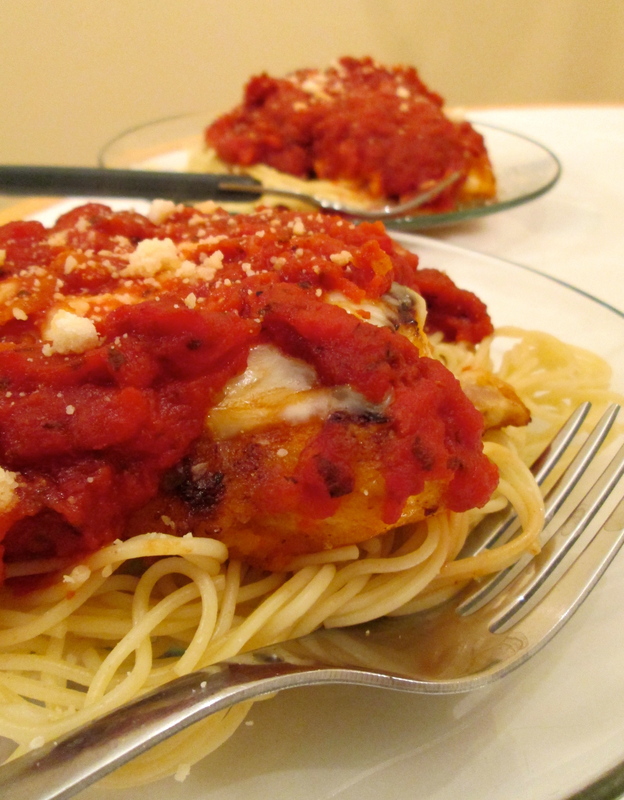 If I had known chicken parmesan was this easy to make, I’d done it a long time ago! I found the original recipe here, but modified it slightly so that it feeds two instead of four. Pound the chicken breasts to about 1/2 inch thick. Whisk the egg and milk. I give a range for the milk depending on your taste. Using 1/2 a cup will give you left overs and is ideal if you are making 3-4 servings. Dip the chicken breasts in the milk and egg mixture and then dip in the bread crumbs. Put a small amount of olive oil (about 3 tablespoons) in a skillet and place in chicken breasts. Cook until the chicken is brown and cooked all the way through. This shouldn’t take more than five minutes or so. Set the chicken into a glass baking dish and sprinkle the mozerella on top. Then pour a desired about of sauce over on top. Top with parmesan cheese. Bake at 350° for about 20 to 25 mintues or until the sauce is bubbly. I served mine with spaghetti but most pasta works well! Do you recommend any easy, quick recipes? p.s. To set the record straight, chicken parmesan is not an Italian dish. You’ll only find it on the menu of tourist restaurants in Italy! It’s another example of a delicious American dish with Italian inspiration. This entry was posted in Food and tagged budget, chicken parmesan, easy recipe, fast recipe, miaprimacasa, quick recipe, simple chicken parmesan. Bookmark the permalink.